Yes, I was one of the victims during this flu season. Especially the warm and gooey kind of chocolate dessert. It's time to make something sweet to boost up my immune system again! Ok I admit, it's just one of my excuses to enjoy a simply and delicious dessert.. In the meantime, melt the chocolate in a double boiler and set aside. Whisk them well, add the blueberries and give it a gentle, quick stir. Make sure the mixture is absorbed by all the bread cubes before transfer the baking dish into the oven. If it comes out clean that means your bread pudding is done. Served with chocolate sauce and vanilla bean ice cream if desired. Note that these two optional ingredients do make a big difference for the bread pudding! Oh, this looks good! Artistic photograph, too. You ever think about publishing your own coffee table book of food writing and photographs? 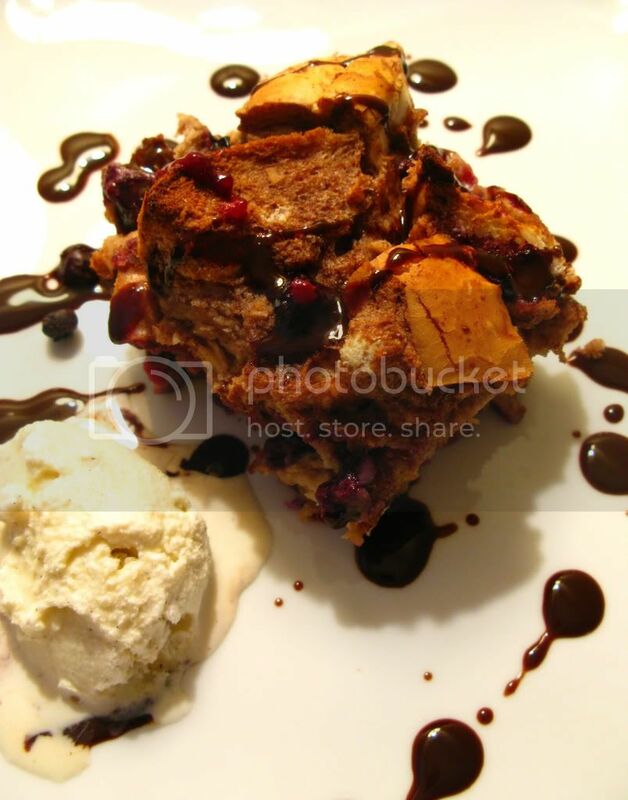 i always love bread pudding...and you topped it off with chocolate, yum! I'm craving for chocolate goodies 24/7! Haha it worked for me! !